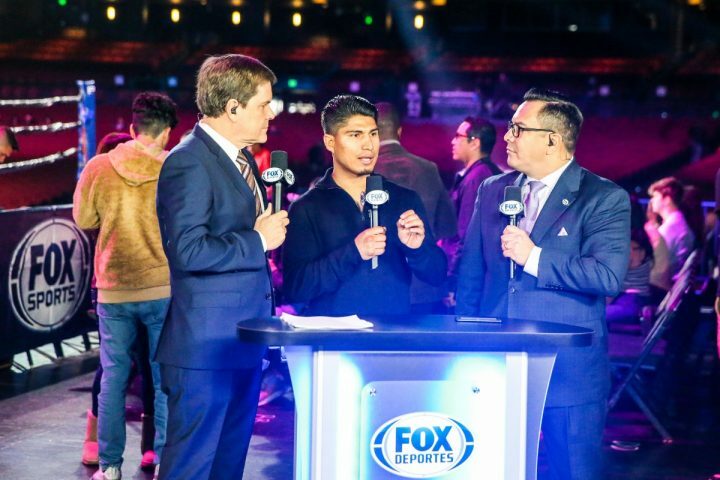 Josesito Lopez: "Mikey Garcia hits as hard as any welterweight"
By Mike Smith: Former two time world title challenger, who just gave WBA Super World welterweight champion Keith ‘One Time’ Thurman a run for his money last January, says Mikey Garcia (39-0, 30 KOs) boxing fans shouldn’t be fooled by his lack of size, he carries his weight up to 147, and he could be a problem for the bigger Errol Spence Jr. (24-0, 21 KOs) next month when they face each other on March 16. Garcia, 31, is moving up a couple of weight classes to challenge Spence for his International Boxing Federation welterweight title on Fox Sports pay-per-view on March 16 at the AT&T Stadium in Arlington, Texas. While a lot of people are ruling out a victory for the 5’6″ Garcia due to his lack of size against the 5’9 1/2″ Spence, Lopez thinks it could be an interesting fight. He says Mikey will have done his homework by the time he’s faced Spence, and he’ll be ready for him next month. “I know Mikey Garcia does his homework,” Josesito Lopez said to Fighthub about the Spence vs. Garcia fight. “He’s at his best. He’s one of the best. He’s out to prove in March. He can carry his power. The size is definitely Spence..you can tell height and length-wise, but if there’s any fighter that I know and I’ve met personally that can carry their weight up into the higher divisions, and put some hands on junior middleweight and middleweights, that’s Mikey,” Josesito said. Lopez, 34, came close to pulling off a big upset last month in losing a 12 round majority decision to Thurman (29-0, 22 KOs) in their fight on January 26 at the Barclays Center in Brooklyn, New York. Thurman, 30, was coming off of a near two-year layoff from boxing, and he wasn’t ready for the fight that Lopez (36-8, 19 KOs) brought to him. Lopez had Thurman out on his feet in the 7th round after hurting him with a big left hook. The referee could have stopped, but he let Thurman stay in there despite Lopez punishing him. Thurman was able to make it out of the round without further hurt, but he soaked up a great deal of punishment. Thurman had been out of the ring for almost two years before the due to a hand and elbow injury. Thurman ended up beating Lopez on points by the scores 119-109, 115-111 and 113-113. It sounds like Josesito has done some sparring with Garcia to know what kind of punching power he possesses. In looking at Garcia hit the heavy bag in recent training video, it’s readily apparent that he is hitting like a welterweight. Mikey was almost a huge puncher for lightweight, and his power carried to 140, as we saw with his one-sided wins over Adrien Broner and Sergey Lipinets. If Spence doesn’t respect Garcia’s power on March 16, he could become knockout victim number 31 on the night. Spence isn’t facing Chris Algieri, Lamont Peterson or Carlos Ocampo. He’s fighting one of the biggest punchers the lighter weight classes has seen for a while in Mikey Garcia. Josesito sees Garcia as having punching power that can carry all the way to 154 and 160, which is phenomenal. “I think it’s a tactical chess match, and I think that it probably goes the distance. I think most people will be surprised by Mikey’s power. He can carry his power,” Lopez said. Spence will try and punch with Mikey early on just due to the adenalin rush from fighting in front of such a large crowd at the AT&T Stadium in Arlington. A huge crowd is going to be on hand to watch the two unbeaten combatants go at it. It’s possible that Spence, 29, will get careless in the first two rounds, and end up getting clipped by Garcia with something big. It’ll be up to Spence to see if he can get his wits about him after that to survive, and adapt his game. If Garcia hurts Spence badly enough in the first two rounds, he’ll look to finish him off the way he’d done other fighters in the past. The worst thing that Garcia can do is be patient if he hurts Spence. Being patient has worked for Garcia during his career against guys that didn’t possess the power that Spence has, but in this fight, he has to make sure that he takes full advantage of the situation if he gets Errol hurt in the early going. it might be only his only chance to win the fight. Spence could choose to back off stay at range the remainder of the fight, and take advantage of his height and reach. Mikey might not get another chance to hurt Spence if he goes into a cautious mode. It would be major shocker if Garcia beats Spence. Almost no one is giving Garcia much of any chance of winning the fight due to him moving up in weight, and being the smaller guy. Spence hasn’t been fighting a lot of shorter guys like Garcia. A comparable opponent to Garcia in terms of size was Leonard Bundu, who Spence stopped in the sixth round in 2016. Bundu was landing some shots in the first five rounds. However, Spence caught him with a uppercut in the 6th, and put him away. Bundu was never as talented as Garcia, though. “The fight was close, but I felt like I could have done a lot better,” Lopez said about his recent fight against Thurman. “He’s strong, but not crazy. I’ve faced strong fighters. He matches up against any strong fighters I’ve faced. Canelo was very heavy handed, and solid. A little shorter than me, but he was definitely carried the weight well,” Lopez said of Canelo Alvarez. Lopez did very well against Thurman, but it didn’t work out his way. In Lopez’s fifth round knockout loss to Canelo Alvarez in 2012, he never stood a chance in that fight. Lopez moved up from light welterweight, and he didn’t have the size to compete with Canelo. Lopez ended up getting dropped three times by Alvarez before the fight was halted in the 5th. Before facing Canelo, Josesito had pulled off a big upset in stopping Victor Ortiz in the 9th round after he quit due to a broken jaw in their fight in June 2012. Josesito says he wants to fight three times in 2019, and he plans on getting back into the ring by the summer for his next match. He wants the big fights against the big names at 147.